Speaking with many HVAC wholesalers, the HFC certification rescission may have negative impacts on their liability and business. The benefit of certification is that wholesalers are able to sell refrigerants to a technician which has sufficient background and understanding of their liability of the Clean Air Act. Without EPA’s direct enforcement, requiring the wholesaler to verify certification acts as a local check on bad actors willing to buy refrigerants. You can find our full comments here. In addition to Dynatemp International’s opposition to the rule revisions, 15 US state Attorney Generals and the District of Columbia sent a letter to the EPA “strongly opposing” it’s proposed rule. At the HARDI conference, Jeremy Arling, Lead Environmental Protection Specialist at US EPA, indicated that the EPA would release their decision on their proposed rule revisions around the beginning of 2019. We will keep you informed as new information becomes available. As we end 2018 and look ahead to 2019, there are several questions regarding the refrigerant market that will weigh heavily on the mind of the refrigerant industry. From reduced R22 allocations, to the complicated political landscape, every aspect of our business is affected in different ways, and to varying degrees, by the many outside forces at work. This will serve as a general overview of the market as it stands, as well as lay out several factors that will affect refrigerant in 2019. First and foremost, the HCFC phase out continues, with 2019 seeing further reduction of the available virgin material to just 4.4M lbs. Furthermore, 2019 is the last year that virgin R22 will be available. As evidenced by the latest reclamation numbers from the EPA, there will be a supply issue for R22 if demand remains as strong as it was in 2018. While we have seen new equipment shift almost exclusively to R410A, the service demand for R22 remains strong, and we expect that trend to continue. While the market price of R22 fell over the last 12 months, continued reductions and high demand should stabilize and push the price higher in 2019. HCFC R22 alternatives saw growth in 2018, although the falling price of R22 discouraged some from switching to a replacement. Due to the cost savings and ease of transition presented by some replacements, we expect 2019 to be a pivotal year in the R22 alternative market. For equipment that is unlikely to be replaced in 2019, we expect demand growth for R22 replacements to match or exceed 2018. If you or your customers have not yet chosen an R22 replacement to offer for sale, it is highly recommended that you incorporate it into your plans moving forward. While the market size of R22 remains much larger for now, the shift is undeniable, and we will see the replacement market grow as equipment ages and R22 becomes more difficult to buy and utilize. The biggest question in 2019 is going to be the HFC market. Due to increased environmental guidelines in China (by far the largest source of refrigerant and components), governmental and political jockeying, and growing global demand for HFC’s, we could see significant disruption in 2019. While some tariffs are on “temporary” hold, an expected trade war between the United States and China could have far-reaching consequences. A recent lawsuit challenging the scope of the previous anti-dumping ruling (which excluded HFC components) is working its way through the legal system, and could have an effect on future pricing. Since signaling that the US would withdraw from the Paris Accord, and the uncertain status of our position on the Kigali Amendment, several countries and entities (notably China and California) have forged ahead with aggressive plans to meet or exceed the greenhouse gas reductions laid out in the amendment. After the threshold of 20 nations required for ratification of Kigali was reached in November of 2017, the planned rollout on 1/1/2019 will proceed as planned. Whether the United States will be a full participant, and will hold to the regulations laid out therein remains to be seen. Regardless of our participation, the rest of the world is moving forward with aggressive goals and legislation designed to slow or reverse the effects of man-made climate change. California (through C.A.R.B and SB 1013) has presented an aggressive plan to curtail the effects of HFC emissions. Currently, 19 other states have indicated that they will follow California’s lead and enact state-level regulations in the absence of Federal guidelines. This could lead to confusion and chaos in the marketplace if some refrigerants are allowed in some states, but not others. However, there is broad support for ratifying the Kigali Amendment across the industry, and it should be an easy political win. Recent talks have shown that the Senate and White House might be willing to entertain the idea of ratification, but it is generally a slow moving process, and one that has many interests vying for certain provisions. Long-term, this carries immense trade risks for the United States, but those are unlikely to be realized until 2030 or later. In the interim, we will likely see the effects of the agreement in more subtle ways. China has seen to it to take the lead in environmental regulations, shuttering factories and mines that do not meet stringent quality and safety standards now in place. This has the effect of squeezing the supply of both raw materials and finished goods for the rest of the world. We expect this trend to continue through Q1. In addition to reductions in supply, domestic (Chinese) demand is also increasing rapidly. This means an ever-growing proportion of Chinese-manufactured refrigerant is going to serve the Chinese market, thus lowering the amount available for export to other countries, such as the US and EU. While we have seen many companies pivot to importing component materials to the US and packaging domestically, we expect the bottleneck of supply to remain tight for some time. There is no crystal ball to predict the future of the refrigerant market, either in the short- or long-term. With so many factors affecting the domestic availability and pricing, it is becoming a more complex problem with every passing day. The best recommendation for 2019 and beyond is to know your refrigerant partners, and listen to advice and suggestions from sources you trust. While no one can tell you what to do with certainty, maintaining a running dialog will help alleviate some of the potential pitfalls of making the “wrong” decision. In a world in which changing political landscapes both here and abroad can have industry-wide effects, and with so much uncertainty in the market, it is vitally important to stay abreast of the news and trends in the industry. We will work together with our Sales Representatives to ensure that you receive up-to-date news to help inform your decisions moving forward. Please let us know if you have any questions, and we look forward to serving you in 2019! On September 18, 2018, Acting EPA Administrator Andrew Wheeler signed the proposed rule, “Protection of Stratospheric Ozone: Revisions to the Refrigerant Management Program’s Extension to Substitutes”. This action proposes to revisit the Agency’s recent approach to regulating appliances containing substitute refrigerants such as hydrofluorocarbons (HFCs) by proposing to rescind the November 18, 2016 extension of the leak repair provisions to appliances using substitute refrigerants. This proposal also requests public comment on rescinding other provisions that were extended to substitute refrigerants, namely HFC’s. This proposal would not affect the requirements for ozone-depleting refrigerants such as CFC’s or HCFC’s. If finalized as proposed, this action would rescind the leak repair and maintenance requirements at 40 CFR 82.157 for substitute refrigerants and would go back to applying only to ozone-depleting substances. This proposed rule will have a 45-day public comment period. To view the public docket in the Federal Register, visit www.regulations.gov and search for docket number EPA-HQ-OAR-2017-0629. On November 18th, 2016, the EPA issued a final rule updating its refrigerant management regulations. While the regulation took effect on January 1st, 2017, some provisions had compliance dates of January 1st, 2018, and January 1st, 2019. Among other things, that rule extended the refrigerant management requirements to common substitutes like hydrofluorocarbons (HFCs). The 2016 rule and the compliance dates currently remain in effect. 1.) Extended the requirements of the Refrigerant Management Program to cover substitute refrigerants, such as HFCs. 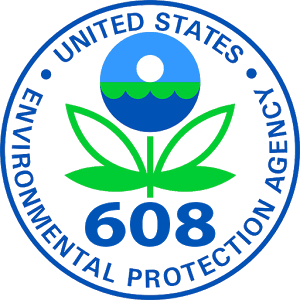 Note that EPA has previously exempted some substitutes from the Section 608 venting prohibition through previous rules. Such substitutes are also exempt from the requirements of this rule. This fact sheet describes the requirements of the Section 608 Refrigerant Management Program. Fact sheets on how the rule affects the Program are found at the bottom of this page. 2.) Lowered the leak rate thresholds that trigger the duty to repair refrigeration and air-conditioning equipment containing 50 or more pounds of refrigerant. 3.) Required quarterly/annual leak inspections or continuous monitoring devices for refrigeration and air-conditioning equipment that have exceeded the threshold leak rate. 4.) Required owners/operators to submit reports to EPA if systems containing 50 or more pounds of refrigerant leak 125% or more of their full charge in one calendar year. 5.) Extended the sales restriction to HFCs and other non-exempt substitutes, with the exception of small cans (containing 2 pounds or less) of non-exempt substitutes (e.g., primarily HFC-134a) for motor vehicle air conditioner servicing. These small cans can continue to be sold without technician certification so long as the small cans have a self-sealing valve to reduce refrigerant releases. 6.) Required technicians to keep a record of refrigerant recovered during system disposal from systems with a charge size from 5–50 lbs. Recently, we’ve received questions regarding whether Dynatemp’s products require a Proposition 65 label or not. In this post, we hope to answer your questions and provide you with links to all of the Prop 65 information you may need. Cylinders that contain brass need Prop 65 warning labels because of the lead component in brass. Dynatemp’s cylinders do not contain brass and therefore do not need a Prop 65 label. At this time all of the refrigerants we offer are not on the Prop 65 list and do not require a warning label. In conclusion, none of Dynatemp’s products require a Prop 65 warning label. If changes occur we will keep you posted. Follow the link for more Prop 65 info, including lists of affected products and FAQs.